The Gadgets is one of the most exciting feature of the blessTag application. The gadgets are several practical applications which work as well-defined software modules and use one or more sensors from a specific SensorTag to achieve a concrete, fully functional and useful application. On the main user interface, a special button is designated to access these specific applications. Clicking on “Gadgets” button, a new window will open which will allow the execution of all these applications. This application simulates a real compass and can be used for navigation and orientation – showing direction relative to the geographic cardinal directions. This software module works with CC2650STK or CC2541DK – only these devices incorporates a magnetometer sensor. 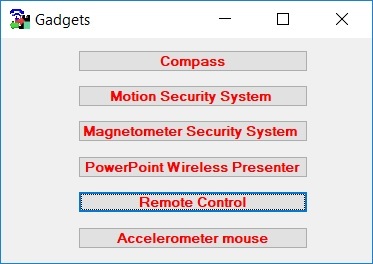 The compass application is the only software module that requires the user to configure manually a SensorTag - in order to activate the magnetometer sensor. This is an advantage from the point of view of the possibility to view, in the same time, the magnetic information decomposed on each of the three channels (x, y, z) in numeric or graphic mode. The compass module requires, as all compasses, a calibration process. All the software modules that follows does not requires any type of user configuration of the SensorTags. The blessTags application makes all the specific configurations, required by each software module in part. This module is able to supervise the changes of position or rotation of a specific object and it will warn you when this will happen. If someone moves (even one centimeter) your luggage, door etc., the app will warn you audio and/or visually of this … and the thief will be caught or you will be advertise regarding this situation. The motion security system is able to work only with CC2650 SensorTag – this is the only SensorTag that support wake-on-movement function. This application work as a magnetic sensor switch which detects any entry (when the SensorTag is placed to a window or a door) protecting your home or office. The sensitivity level can be adjusted accordingly with the strength of the magnetic field – therefore, proportional to the type and the size of the magnet. The application support only the CC2650STK or CC2541DK SensorTags. The application allows to send different commands from a SensorTag to: (a) any application running on Windows or (b) to the operating system. Each button from the SensorTag can be used to send keyboard shortcuts to specific applications. There are two distinct types of remote commands: (a) predefined ones (for several well-known applications like: PowerPoint, Adobe Reader, Media Player Classic, Windows Media Player, VLC Media Player etc.) and (b) customizable by the user (a combination of up to three keys). This component works with CC2650STK, Thunderboard React, Thunderboard Sense and CC2541DK. The accelerometer mouse module is able to replace a standard mouse device with a SensorTag (with one of the following devices: CC2650STK, Thunderboard React, Thunderboard Sense and CC2541DK). The SensorTag moves the cursor on the screen and replaces the two mouse buttons with the buttons of the SensorTag. The speed of the cursor movement is in the correlation with the rolling angle of the SensorTag. 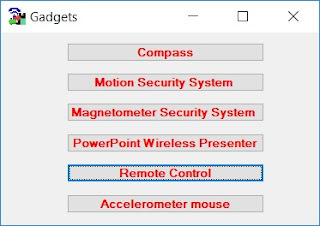 In the implementation of this wireless presenter module the entire control of the PowerPoint presentation is from the blessTags environment. With this concept deployed, the user no longer has to deal with the menus of the PowerPoint application. By simply pressing a button from the graphical interface, of the blessTags application, all main functions of the PowerPoint are substituted. Now, using one of the two buttons on the SensorTag the show will go forward to the next slide or return to the previous one. This component (the wireless presenter) works with CC2650STK, Thunderboard React, Thunderboard Sense and CC2541DK. The blessTags application can be downloaded from the Windows Apps Store: https://www.microsoft.com/store/apps/9p054xsjjr1n.